It often takes me some time to come up with something witty to start these recaps. It is perhaps the hardest thing to do in writing, the one real problem, finding the “hook” to draw in your reader. In recent weeks I’ve used movie lines, cliches, you know, whatever it will take. But what if I told you that this piece was aimed at celebrating some real heroes – the gritty, overlooked guys who play hard every single day, but don’t usually end up getting the praise. And…here’s a look at the players that best combined players from the top performers table. What you probably expected to happen last night, didn’t happen, and as a result a pair of contrarian stacks (Marlins and Rangers) along with the perfect recipe of mix and matched lineups took home all the money. Going into last night, plenty of us were salivating at the thought of the Blue Jays against a young left-handed pitcher. The core set of Blue Jays right-handed hitters each held ownerships approaching 20% while the combined ownership percentages for many of the winning lineups didn’t even add up to 20. 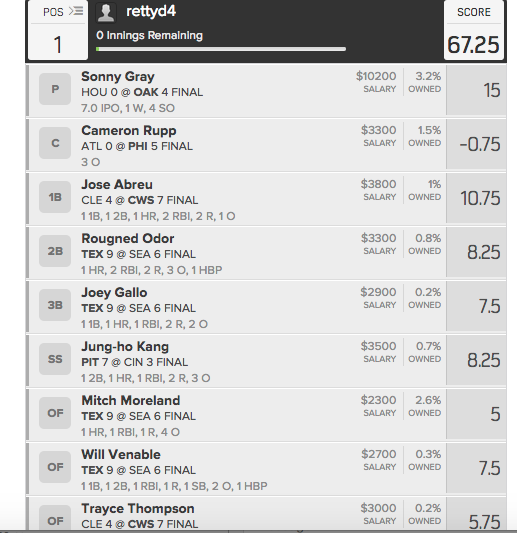 Take for instance the winner of the $5 Rally on FanDuel, rettyd4. Rettyd4 avoided all Blue Jays right-handers and instead used a mixed and matched lineup with a mini-Rangers stack. His total ownership level, including pitcher Sonny Gray, was 10.5% owned. How did he do that you might ask? I’m not sure, but take a look for yourself. Last night the big decision was whether or not to pay for Clayton Kershaw. Given his astronomical prices, a lot of us said no, and went on our merry way. Given that you didn’t pay for Kershaw though, where did you end up spending your money? If you took a look at the leaderboards, including the winning lineups on DraftKings, you’ll notice that the winners splurged on two different arms, Francisco Liriano and Masahiro Tanaka. This got your team off on a great start, as both Tanaka and Liriano put up over thirty points, and didn’t break the bank, allowing you to pay up for bigger bats (although the winners used cheaper, more contrarian bats). On FanDuel, a one pitcher site, the strategy was a little bit different and ownerships experienced a wider range. Kershaw was locked into 15% of rosters, while Aaron Nola, Tanaka and others rounded out the position. Some of you might recall a Will Ferrell scene in the movie Kicking and Screaming where he is confronted with an awkward situation about “different” people. Of course he tries to squirm his way out of the situation, but he doesn’t do so gracefully. Last night it was better to be different, staying away from the top owned players and insteading opting to go with more contrarian stack options like the Miami Marlins and Texas Rangers. The strange thing about last night is that the Rangers and Marlins were both playing in pitchers ballparks, typically not good choices for full stacks. Although, as I showed in my “GPP Stacking with Park Factors” experiment last year, choosing full stacks of players in bad ballparks usually leads to very low ownership percentages, and when something does happen to go right, you end up taking all the money from everyone. Leaving you with just one Tommy Boy clip wouldn’t have been enough. Congrats to all the winners, and better luck to us losers next week!